A skunk enjoying a drink from one of our many bird baths. Yesterday morning, shortly after 5am, Rob went out to fill the bird feeders before heading to work. He wasn't long coming back in exclaiming, "There's a skunk in the backyard!" 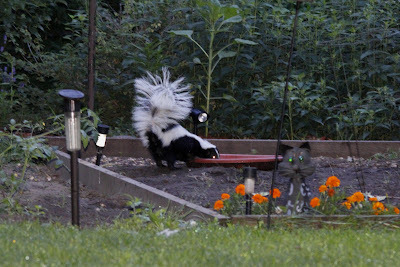 We haven't seen a skunk in our backyard for five years or more, so we were pretty excited. I watched the little guy roam around our yard from the safety of the kitchen window. Rob grabbed his camera and quietly went back outside to snap a few pics. Our yard is quite long, so he was able to keep a respectable distance. Unfortunately due to our surprise backyard early morning visitor, the birds had to wait until Rob got home from work to fill the feeders, but I'm sure they managed. Hope he comes to visit again! To learn more about skunks, please click here.